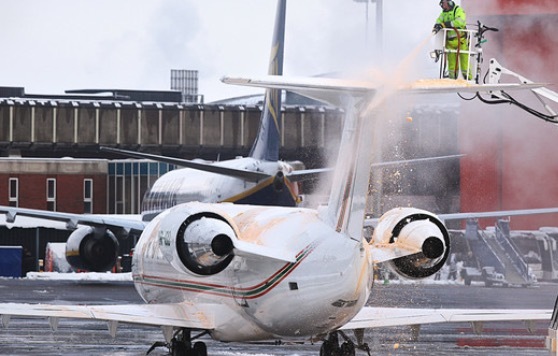 Aircraft deicing, how does this affect your flight? Aircraft deicing. How does this apply on a private jet, with safety and cost? We all know the extra time it takes when we wake to the first frost of the season when we have to de-ice the car, running around looking for a scraper, or last year’s can of de-icing fluid. Aircraft deicing takes it to another level. Aircraft, like cars need de-icing before they fly. Unlike cars, an aircraft by law must be de-iced before it departs, regardless of any delay it might have to your flight. Any snow and ice accretion must be removed from the aircraft. Aircraft deicing is essential for safe operation. Snow and Ice on an aircraft add weight and adversely affect the aerodynamics of the aircraft and its control surfaces. Even a coarse grade sandpaper thickness of frost on the leading edge on the upper surface of the aircraft wing can reduce lift by upto 30%. This also applies to the tail fin and the horizontal stabiliser (tailplane); all the aircraft surfaces need to be clear of any frost/ice to ensure the aircraft can operate safely. De-icing a private jet takes places the same way as it does for any other aircraft. Many passengers have experienced being on board an airliner while a ground crew team manoeuvre round the aircraft on a specialised de-icing vehicle or rig, using a high pressure hose which covers the aircraft in a heated solution which destroys the ice. What goes into the de-icing solution? The fluid is commonly known as ethylene glycol (EG) or propylene glycol (PG), which contains a number of components including water, thickening agents, dye, and corrosion inhibitors. Mixing the solution with water allows the fluid to work effectively in temperatures as low as −55 °C. The de-icing fluid has a limited, functional time, the (HOT), holdover time, and this depends on what category fluid is used. Type IV fluids generally provide a holdover time (HOT) between 30 and 80 minutes, and is the most prevalent de-icing fluid used. Depending on the temperatures, level of freezing, and aircraft take off speeds, the de-icing solution comes in four categories, type I, II, III and IV. De-icing a private jet will vary in cost according to the size of the aircraft. The typical cost is €6 EUR per litre of heated solution. De-icing a small private jet can cost around €1,200.00 EUR, upto €3,000.00 EUR for a long range private jet, and upto €11,500.00 EUR for an airliner. What is the de-icing cost to you when chartering a private jet? The cost will be dependent on the aircraft size and the airport, and the cost is not included in the cost of the private jet charter unless otherwise specified. The cost for de-icing will be invoiced post flight. As the requirement for aircraft deicing increases, many operators provide a aircraft deicing insurance policy which allows you to pay prior to flight. The premium payable for this policy is a fraction of the cost of de-icing the private jet, and will cover the de-icing costs incurred. The insurance waiver premium for de-icing a small private jet can be as little as €160.00 EUR per flight. The policy works the same way as any insurance works; it is a set aside to cover you against a possible occurrence. Most airports which have de-icing services are maintained by one or maybe two suppliers at most. As the actual cost for de-icing is dependent on the volume of de-icing fluid used, costs can vary, and this is why there is good financial value in paying the additional insurance premium to cover this variable cost. The insurance policy to protect you against de-icing costs can be purchased even on the day of flight in most cases, which allows the decision on weather and possible de-icing to be accurately forecast. If the aircraft is de-iced, and there is a long hold before take-off, a second de-icing solution may need to be applied (at peak times, at some busy airports, this can occur); again this will be covered by the insurance policy. If de-icing is a necessity? In the event that your aircraft does require de-icing, Freedom Air can request the actual cost to undertake this so you can benefit from the de-icing insurance policy and the smaller premium relative to the actual cost. Where possible we ask the flight crews to remove as much of the ice and frost from the aircraft thus reducing the volume of fluid which will need to be applied to the aircraft, and keeping the cost down. How does the process prevent ice from re-occurring in the air? Once airborne, depending on the aircraft, pneumatic, electrical and bleed air systems provide an “anti-ice” application method to the leading edges of the control surfaces, engines, and propeller blades to manage and remove any ice accretion. Most modern civil airliners draw “bleed air” from the engines, and it is ducted into cavities beneath the control surface leading edges to maintain the surface temperature above (0 ° Celsius).